Note: Click here to download John’s top productivity, discipline, and focus tips from this episode. John Lee Dumas is the host of EOFire, where he interviews today’s most successful entrepreneurs 7-days a week. JLD has grown EOFire into a multi-million dollar a year business with over 1,500 interviews and 1.5 million monthly listens. 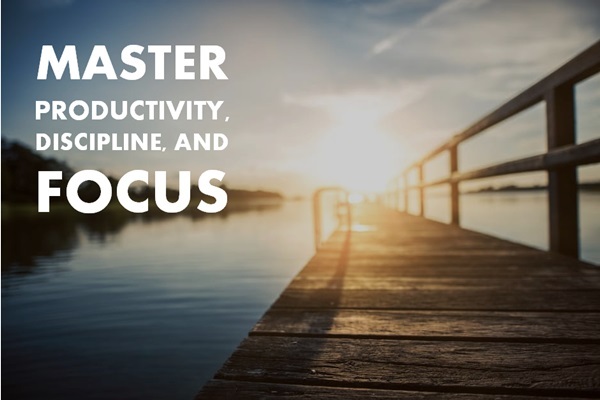 His latest project is The Mastery Journal: Master productivity, discipline, and focus in 100 days. You can learn more at TheMasteryJournal.com. Longtime listeners may remember hearing John way back on episode 15 of The Side Hustle Show. Three and a half years and 199 episodes later, I’m excited and honored to have him back on the show. John is the undisputed king of productivity, discipline, and focus–the guy is a machine! These are the things I struggle with at times–especially focus–and things I constantly hear as challenges from Side Hustle Nation. In fact, I’ve asked thousands of subscribers “what’s holding you back?”, and the lack of time and focus are among the most popular responses. In this episode, John takes you through some of his top productivity, discipline, and focus tips that anyone can incorporate into their day, business, and lifestyle. He explains why planning your day helps you avoid OPA (Other People’s Agenda) and keeps you on a productive and focused path. John has developed The Mastery Journal based on his own success building his 7-figure business, and in this episode he shares some of his top tips and gives an insight into the habits and routines that got him where he is today. Click here to download John’s productivity, discipline, and focus tips from this episode. Why “We win tomorrow today” is such an important and pivotal part of John’s daily schedule. What John’s morning schedule is every day to get off to a super-productive start to each and every day. How John monitors his brainwaves while meditating to get the most out his 7-minute daily meditation. When you know it’s the right time to FOCUS (Follow One Course Until Success) or the time to change direction. The productivity tools John uses within his business on a daily basis. How the Pomodoro technique can increase your productivity. Why tracking your progress is important to helping you become more productive. How The Mastery Journal can help you and your business. That time I was a guest on EOFire. I absolutely love the aside you put in this podcast. The funny thing was as your aside came on, I was driving and was practicing the belly breathing you and John were discussing. As usual, Great work Sir! Really enjoyed being a guest on your show Nick! Thanks for the great opportunity, AGAIN!! Thanks John! It was a fun one! Thanks for the mention! I want to clarify for listeners that I utilize two different effort-tracking systems: the spreadsheet and the calendar chain. The spreadsheet is for many tasks with a weekly target for each. I mark when I do them and tally it all up at the end of the week. The calendar chain is for the one task that I’m committed to making a daily habit, and the goal is to not break the streak. Since starting my calendar chain for meditation 16 months ago, I’ve missed only 7 days. Simple yet brilliant! I’ve listened to this episode of number of times now. It’s great!